Jarid Vollmer wrapped up his second consecutive MBRP Diesel Drag Racing Series National Championship after the Big Sky Truck Fest in August. But Jarid came to the World Finals looking for the World Championship in Pro Street. Vollmer set the diesel world on fire back in June as he laid down a new NHRDA Pro Street record at 8.81 seconds and 157.08 mph. 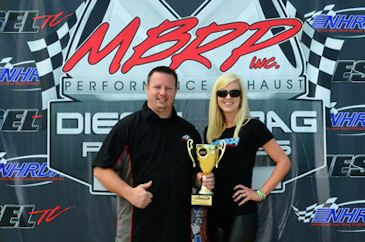 Vollmer had a few mechanical problems on Saturday and lost in the early part of eliminations but the team was still excited to have clinched their second consecutive MBRP Diesel Drag Racing Series National Championship.